Thick-It AquaCare H2O Thickened Juice from HealthyKin.com is specifically designed to provide proper nutrition and hydration for people with swallowing disorders. It is ready-to-drink and made from 100% juice. 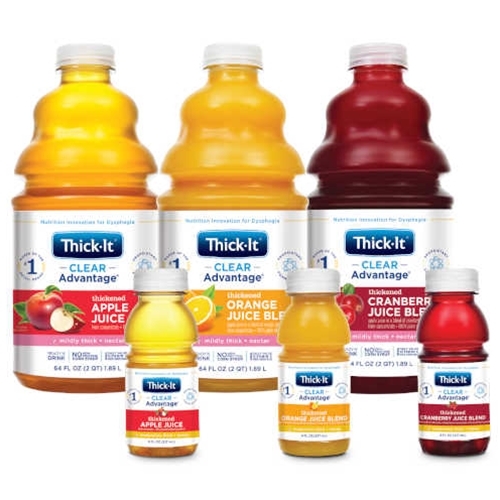 Thick-It AquaCare H2O Thickened Juice does not contain high-fructose corn syrup or added sugars. Add this delicious juice to your breakfast, lunch or dinner menu, freeze into a popsicle treat or enjoy anytime you are looking for a refreshing, nutritious juice break. Super fast delivery, great product, reasonable price thank you! By far my favorite thickened beverage flavor and brand. Ships within a few days. Best price by far. I enjoy this apple juice. It always arrives within a few days, and in good shape. Very Pleased with the Apple Juice. Great product!! We just wish it were more affordable. Mom really likes the nectar thickened orange juice and healthy kin service is very prompt.